Loved by Fred. Olsens's staff and guests alike, beautiful Boudicca oozes a sense of class, style and elegance not seen or experienced on modern megaships and floating theme parks. On board Boudicca, like on all Fred. 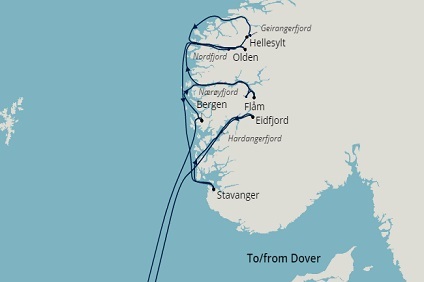 Olsen ships, the emphasis is on providing an intimate and more traditional cruise experience, ensuring our guests disembark after their relaxing holiday as friends, not just customers. Enjoy yourself with delicious dinners in the Four Seasons, Tintagel or the Heligan Room restaurants; take a dip in one of the three heated pools; watch a show in the Neptune Lounge; simply relax on the Sun Deck; enjoy al fresco dining at The Grill and much more without ever feeling overcrowded. Cruising alongside hundreds, not thousands of like-minded travellers also ensures that staff on board Boudicca can provide Fred. Olsen’s renowned personal, attentive service, catering to your every want and need. 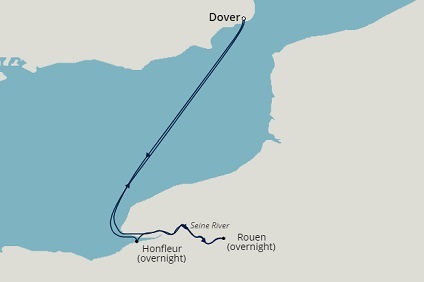 14 Night Cruise sailing from Dover roundtrip aboard Boudicca. 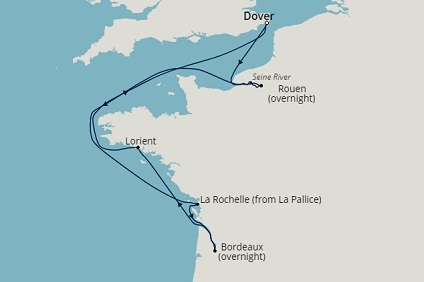 5 Night Cruise sailing from Dover roundtrip aboard Boudicca. 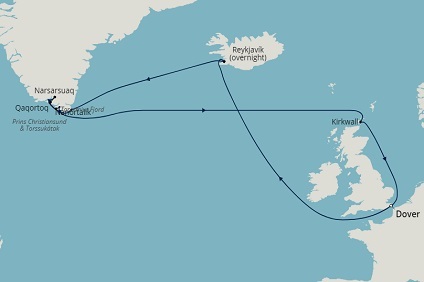 Spend 11nts sailing from Dover to islands of Sweden, Denmark and Finland - - PLUS receive up to €200 per room FREE on-shore spending - book by 3 July. 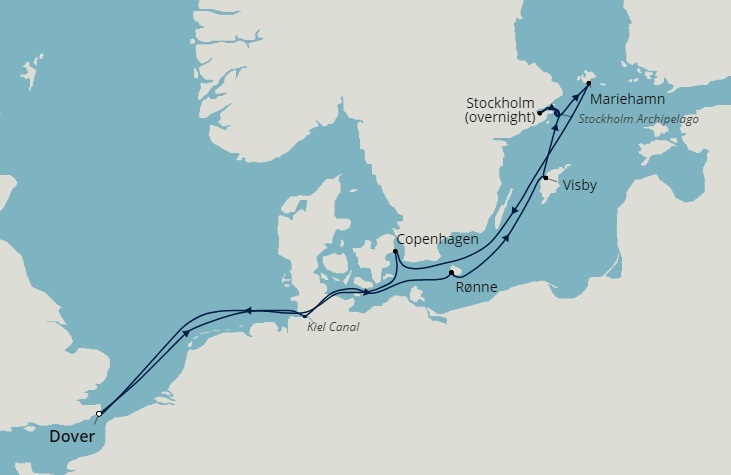 11 Night Cruise sailing from Stockholm roundtrip aboard Boudicca. 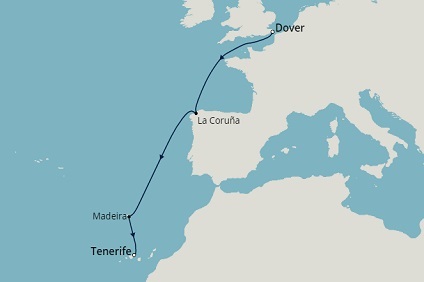 7 Night Cruise sailing from Dover to Santa Cruz aboard Boudicca. 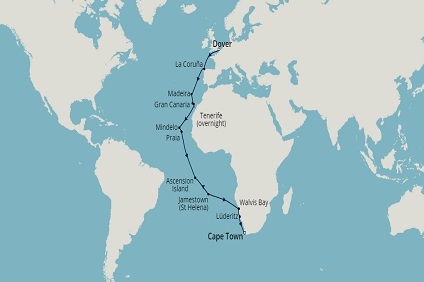 28 Night Cruise sailing from Dover to Cape Town aboard Boudicca. 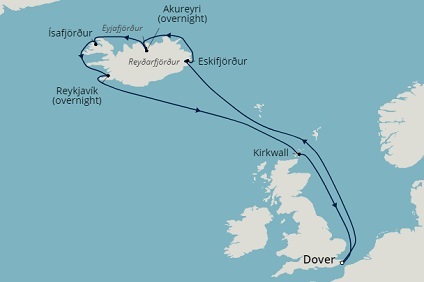 168 Night World Cruise sailing from Dover roundtrip aboard Boudicca. 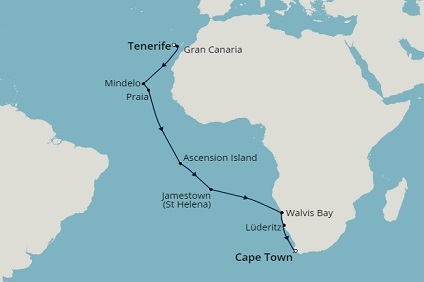 21 Night Cruise sailing from Santa Cruz to Cape Town aboard Boudicca. This cabin is approximately 550 square feet in size and can be found on Marquee Deck 9. These cabins include a sitting area, floor to ceiling windows, a balcony, bathroom with bathtub and shower. Facilities include air conditioning, telephone, safe, hairdryer, fridge & mini bar. 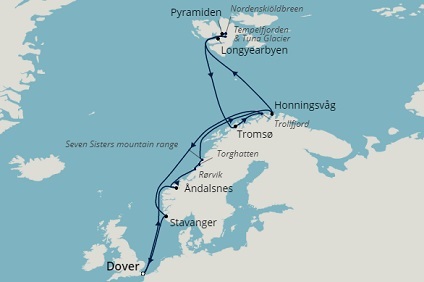 All cabins are non-smoking, have 24 hour room service and require a European 2 pin plug (220 volts). Smoking is permitted on room balconies. Please note that lifeboats and life rafts may affect views from all deck 8 & 9 balconies. Guests also benefit from our Suite Dreams package, which includes a welcome bottle of sparkling wine, flowers in your Suite, luxury towels, complimentary water and much more to ensure your stay is even more comfortable, relaxing and memorable. These suites are approximately 440 square feet in size and can be found on Marquee Deck 9. They have a sitting area with floor to ceiling windows, a balcony and bathroom with bathtub and shower. Facilities include air conditioning, telephone, safe, hairdryer, mini bar & fridge. All rooms are non-smoking, have 24 hour room service and require a European 2 pin plug (220 volts). Smoking is permitted on room balconies. Please note that lifeboats and life rafts may affect views from all deck 8 & 9 balconies. Guests also benefit from our Suite Dreams package, which includes a welcome bottle of sparkling wine, flowers in your Suite, luxury towels, complimentary water and much more to ensure your stay is even more comfortable, relaxing and memorable. This suite is approximately 260 square feet in size and can be found on Marquee Deck 9 and Bridge Deck 8. These suites have a separate sitting area, balcony, bathroom with bathtub and/or shower. Facilities include air conditioning, telephone, safe, hairdryer and fridge. All rooms are non-smoking, have 24 hour room service and require a European 2 pin plug (220 volts). Smoking is permitted on room balconies. Please note that lifeboats and life rafts may affect views from all deck 8 & 9 balconies. Guests also benefit from our Suite Dreams package, which includes a welcome bottle of sparkling wine, flowers in your Suite, luxury towels, complimentary water and much more to ensure your stay is even more comfortable, relaxing and memorable. This suite is approximately 200 square feet in size and can found on Bridge Deck 8. It is equipped with a bedroom & sitting area, picture windows and balcony, bathroom with bath and/or shower. Facilities include air conditioning, telephone, safe, hairdryer and fridge. 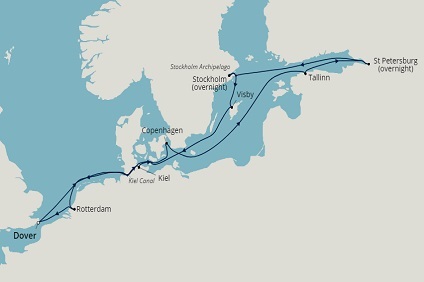 All cabins are non-smoking, have 24 hour room service and require a European 2 pin plug (220 volts). Smoking is permitted on room balconies. Please note, rooms on bridge deck may have restricted views from the lifeboats. Guests also benefit from our Suite Dreams package, which includes a welcome bottle of sparkling wine, flowers in your Suite, luxury towels, complimentary water and much more to ensure your stay is even more comfortable, relaxing and memorable. This suite is approximately 260 square feet in size and can be found on Lido Deck. These suites have a bedroom and sitting area, a terrace balcony, and a bathroom with bathtub and shower. Facilities include air conditioning, telephone, safe, hairdryer and mini-bar. All rooms are non-smoking, have 24 hour room service and require a European 2 pin plug (220 volts). This room grade benefits from the Suite Dreams package,which includes a welcome bottle of sparkling wine, flowers in your Suite, luxury towels, complimentary water and much more to ensure your stay is even more comfortable, relaxing and memorable. This suite is slightly larger than J & K grade and can be found on the Bridge Deck 8. It has a balcony and bathroom with bathtub and/or shower. Facilities include air conditioning, telephone, safe and a hairdryer. All rooms are non-smoking, have 24 hour room service and require a European 2 pin plug (220 volts). Smoking is permitted on room balconies. 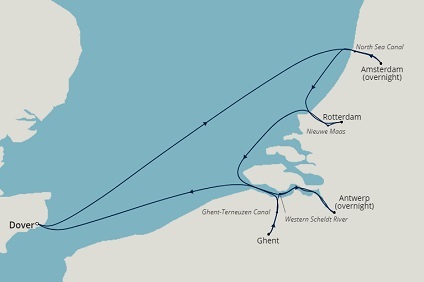 Please note that lifeboats and life rafts may affect views from all deck 8 & 9 balconies. This suite is approximately 240 square feet in size and can be found on Lido and Main Deck. This suite has a seating area, picture window and bathroom with bathtub and shower. Facilities include air conditioning, an interactive television, telephone, safe, hairdryer and fridge. All rooms are non-smoking, have 24 hour room service and require a European 2 pin plug (220 volts). This room is approximately 160 square feet in size and can be found on Bridge Deck 8. It has a balcony, bathroom with shower. Facilities include air conditioning, telephone, safe and a hairdryer. All rooms are non-smoking, have 24 hour room service and require a European 2 pin plug (220 volts). Smoking is permitted on room balconies. Please note that lifeboats and life rafts may affect views from selected deck 8 balconies. This balcony room is approximately 200 square feet in size and can be found on Lido Deck 7. They have a terrace balcony and a bathroom with bathtub and shower. Facilities include air conditioning, telephone, safe and hairdryer. All rooms are non-smoking, have 24 hour room service and require a European 2 pin plug (220 volts). This room is approximatley 150 square feet in size and can be found on Bridge Deck 8. It has a balcony and a bathroom with bathtub and/ or shower. Facilities include air conditioning, television, telephone, safe and a hairdryer. All rooms are non-smoking, have 24 hour room service and require a European 2 pin plug (220 volts). Please note that lifeboats and life rafts may affect views from all deck 8 & 9 balconies. This room is approximately 160 square feet in size and can be found on Main Deck 5. It has a picture window and a bathroom with bath and/or shower. Facilities include air conditioning, telephone, safe and a hairdryer. All rooms are non-smoking, have 24 hour room service and require a European 2 pin plug (220 volts). This room is approximately 160 square feet in size and can be found on Atlantic Deck 4. It has portholes and a bathroom with bath and/or shower. Facilities include air conditioning, telephone, safe and a hairdryer. All rooms are non-smoking, have 24 hour room service and require a European 2 pin plug (220 volts). This room is approximately 160 square feet in size and can be found on Atlantic Deck 4 and Marina Deck 3. It has portholes, a bathroom with bath and/or shower. Facilities include air conditioning, telephone, safe and a hairdryer. All rooms are non-smoking, have 24 hour room service and require a European 2 pin plug (220 volts). This room is approximately 160 square feet in size and can be found on Marina Deck 3. It has 2 portholes and a bathroom with a bath and/or shower. Facilities include air conditioning, telephone, safe and a hairdryer. All rooms are non-smoking, have 24 hour room service and require a European 2 pin plug (220 volts). 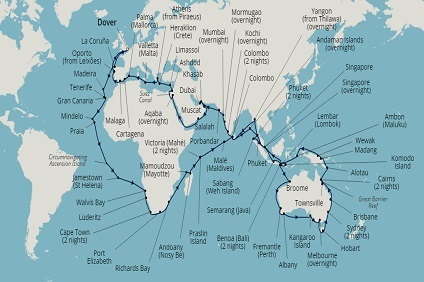 Single travellers can cruise in comfort and style on board Boudicca in one of the ship’s Single Oceanview Rooms. These rooms are approximately 150 square feet in size and can be found on Main Deck 5 and Atlantic Deck 4. These rooms have portholes on Atlantic Deck or a picture window on Main Deck, bathroom with bathtub and/or shower. Facilities include air conditioning, telephone, safe and a hairdryer. All rooms are non-smoking, have 24 hour room service and require a European 2 pin plug (220 volts). 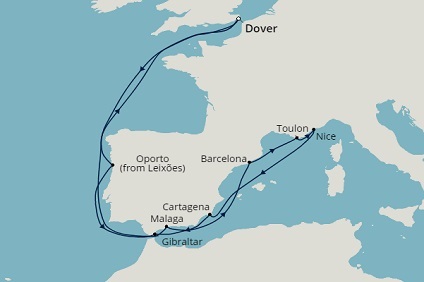 Single travellers can cruise in comfort and style on board Boudicca in one of the ship’s Single Ocean View Rooms. This room is approximately 150 square feet in size and can be found on Atlantic Deck 4. It has 2 portholes, a bathroom with bathtub and/or shower. Facilities include air conditioning, telephone, safe and a hairdryer. All rooms are non-smoking, have 24 hour room service and require a European 2 pin plug (220 volts). This room is approximately 140 square feet in size and can be found on the Atlantic Deck 4. It has a bathroom with a shower. Facilities include air conditioning, telephone, safe and a hairdryer. All rooms are non-smoking, have 24 hour room service and require a European 2 pin plug (220 volts). Boudicca I grade Interior Room (I) I Interior Room This room is approximately 140 square feet in size and can be found on Marina Deck 3. It has a bathroom with a shower. Facilities include air conditioning, telephone, safe and a hairdryer. All rooms are non-smoking, have 24 hour room service and require a European 2 pin plug (220 volts). Single travellers can cruise in comfort and style on board Boudicca in one of the ship’s Single Interior Rooms. This room is approximately 140 square feet in size and can be found on the Main Deck 5. It has a bathroom with a shower. Facilities include air conditioning, telephone, safe and a hairdryer. All rooms are non-smoking, have 24 hour room service and require a European 2 pin plug (220 volts). Single travellers can cruise in comfort and style on board Boudicca in one of the ship’s Single Interior Rooms. This room is approximately 140 square feet in size and can be found on Atlantic Deck 4. It has a bathroom with shower. Facilities include air conditioning, telephone, safe and a hairdryer. All rooms are non-smoking, have 24 hour room service and require a European 2 pin plug (220 volts).